Few couples are as star-crossed as a 19th-century gentlewoman and a mummified Pharoah, but their story is one of the most charming romps you’ll find. From their opening stroll in a London park to an unwitting murder and a daring prison break, the tale of Lillian and Imhotep IV is one filled with drama and adventure. 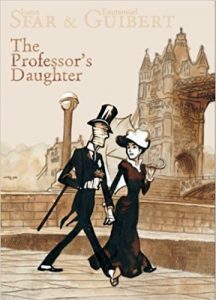 The Professor’s Daughter, created by French masters Joann Sfar and Emmanuel Guibert, also tantalizes with beautifully rendered art panels made up of delicate illustrations, period sepia tones, and fine watercolor washes. Readers new to graphic novels as well as those with more studied appreciation will be tickled by this delightful, fast-paced confection.